This month’s author for the Virtual Book Club for Kids is Jan Brett! We checked out a bunch of her books from our library and have had lots of fun reading them. My littlest one turns 3 on Saturday and is having a gingerbread themed party so, of course, the two Jan Brett books that got the most love were Gingerbread Baby and Gingerbread Friends ! In Gingerbread Baby, Matti is a little boy who uses a special recipe to make his own Gingerbread Baby who gets up and runs out of the house! Everyone in town tries to catch him, but he eludes them all. Meanwhile back at home Matti makes a beautiful little gingerbread house and leaves it in the forest. Gingerbread Baby is so excited to see the gingerbread house that Matti made for him that he runs right inside and stays there. All he needed was a loving home. The kids loved that the Gingerbread Baby lived in the house Matti made so we decided to make our own. We will be making lots of real, edible gingerbread houses at the party this weekend so we switched it up and made an upcycled gingerbread house! 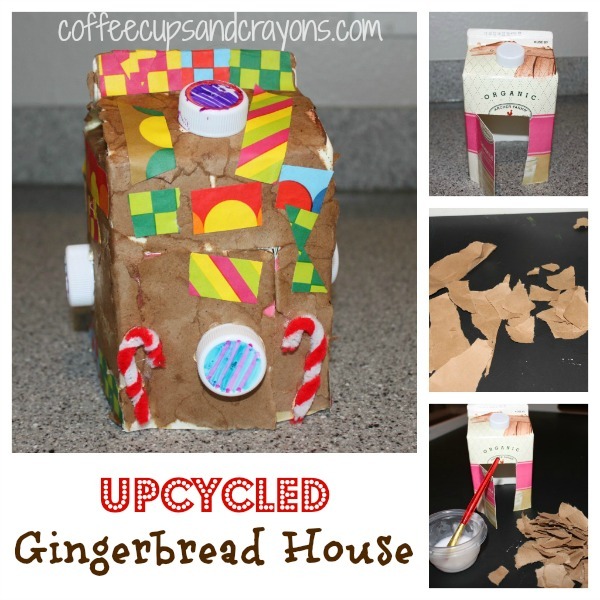 This upcycled gingerbread house is super easy to make! The kids ripped the bag (that had been used to wrap a package that came in the mail) into small pieces and stuck them onto the milk carton with watered down glue. Once it was all covered they painted over the whole thing with the rest of the glue to make sure they would stay put. Then the kids used markers to turn the bottle caps into candy and which I hot glued to the house for them. Then they made little pipe cleaner candy canes and the house with colorful paper tape. Once we had the house it was time to play! In the story Gingerbread Friends, the Gingerbread Baby got lonely and went looking for someone to play with. Eventually, he came home to find out Matti had made him lots of friends to play with. So yesterday after rest time the kids woke up to an invitation to play with play dough to do the same thing! I haven’t made the gingerbread play dough for the party yet so I set out some pumpkin pie play dough we had, googly eyes, and faceted beads from Craft Project Ideas. The kids were super excited and rushed right over to start creating. They played for well over an hour and asked if they can do it again today after school. 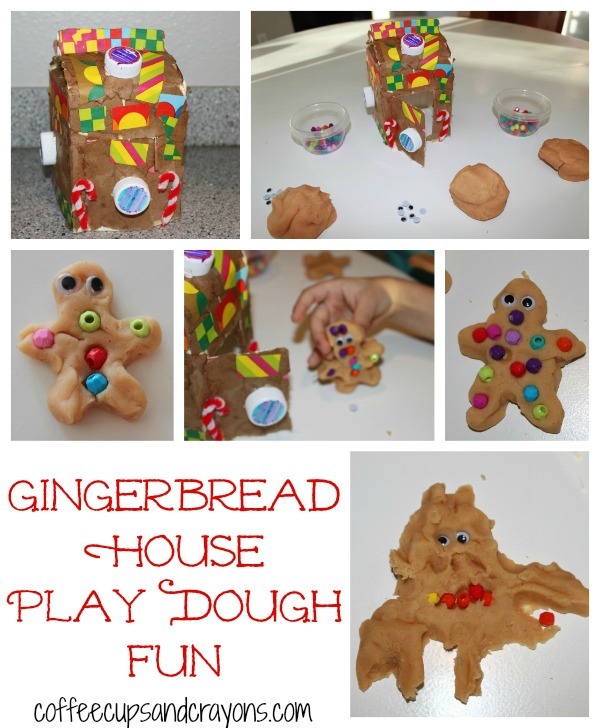 Needless to say the gingerbread play dough friends were a HUGE hit! Be sure to check out the other Jan Brett book and activity ideas from this month! I absolutely LOVE your upcycled gingerbread house. How great. You should share it at Eco-Tuesdays hosted by organic inspirations. We had so much fun doing our Jan Brett activities, but have not gotten a chance to write it up yet! Thanks Jen! I’ll have to check out organice inspirations, it’s new to me. They have had lots of fun playing with it and everyone got to help make it–love those kind of crafts! Gingerbread Baby is a very popular book at our house! I love your upcycled gingerbread house! Thanks so much Ann! My kids love to sing the little song nonstop while they play! A gingerbread birthday party sounds like so much fun. Can’t wait to hear how it goes!